For four generations, Sprung has designed world-class fabric membrane building solutions that consistently outperform other building alternatives. Ready for a faster and better way to build? Permanent or temporary, Sprung structures are inventory-ready and take only weeks to build. They can be dismantled, reconfigured, re-erected, or relocated for almost any number of applications. Beyond providing all-weather shelter for equipment and inventory, Sprung structures provide bright, spacious high performance, energy efficient environments. Quality begins with an intelligent, innovative and flexible design. Quality perseveres with world class performance, unrivaled durability and exceptional value. Sprung is about building relationships with people who value a faster and better way to build: rapid construction, total design flexibility, unrivaled performance and durability, and lower overall costs. Sprung is the inventor of the stressed membrane structure, an engineered clearspan building alternative. With over 12,000 structures erected in 100 countries worldwide, Sprung has the experience and knowledge ready to assist professionals. As Seen On 60 Minutes. Sprung designs and builds high-performance portable building structures that take only days to customize and weeks to build. Our innovative prefab buildings use modular construction, allowing for total design flexibility, all-weather performance and strength, long-term quality, and cost-effectiveness. Sprung fabric buildings were developed from our patented, advanced fabric tensile structure technology – engineered over a century ago but remains an industry leader. Sprung’s modern, relocatable, clear-span fabric building structures allow for rapid modular construction, total design flexibility, and fundamental cost-effectiveness of almost any type of application. 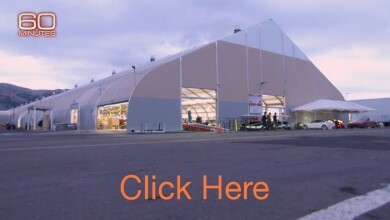 The reliability and durability of our performance architectural membrane fabric structures are demonstrated worldwide, in over 100 countries and countless applications ranging from oil and gas buildings to military barracks, event centers to arenas, and aircraft hangars to mining camp buildings. Sprung portable building structures provide a rapidly buildable, customizable, and easily relocatable solution for any project. For more than a century, Sprung has been synonymous with quality, custom-made prefab buildings that meet specific, unique needs and challenges. After designing and constructing the NASA Space Shuttle housing facility in the early 1980s, Sprung’s reputation for making the world’s most highly advanced portable buildings – also known as modular buildings or temporary structures – became known globally. All Sprung modular building structures are made from extremely high-quality materials and individually tested using strict performance measures. Our portable buildings have proven durability in some of the most extreme climates on earth, from the hottest desert to the windiest arctic tundra and coldest mountain highland. Sprung permanent and temporary structures meet the strict Miami-Dade County Hurricane Compliance Code. The only building left standing in Buras, Louisiana after Hurricane Katrina in 2005 was a Sprung tensile structure. Beyond the technical advantages of our highly advanced fabric structures, their beautiful interior space create an abundance of light and roominess. Natural daylight, high ceilings, and unique windows and doors create depth and spaciousness, and glazing walls add to the open and inviting characteristics of our ultra-functional prefab buildings. A Sprung technical consultant is on-site throughout the entire assembly process to monitor every project, ensuring quality is never compromised and each tensile structure is made to our rigorously high standards. Sprung fabric buildings have an R-25 to R-30 energy efficiency rating, which outperforms other types of construction and results in less environmental impact and lower operational costs. Additionally, there is almost no air leakage, thanks to our unique design and premium insulation. Manufactured in ISO 9001:2008 certified, state-of-the-art factories, each Sprung temporary structure can be customized to your specifications and design requirements. Because all Sprung portable buildings have a modular construction design, they can adapt to immediate relocation requirements. With over 2 million sq. ft. of prefab building inventory on hand, we can help businesses expand to new markets quickly. Learn more about the Sprung Advantage today and contact your nearest Sprung branch to inquire about a quote for fabric buildings customized to your application. Our global manufacturing and distribution resources ensure fast delivery. Build at a rate of up to 2,000 sq. ft. (186 sq. m.) per day. Easily reconfigure, disassemble or relocate. The clear span design is adaptable for multi-use applications in almost any market sector. Our aluminum substructure and patented tensioning system are engineered to outperform and outlast other types of construction. You can count on lower project costs, decreased operating and energy expenses, and reduced maintenance costs. © 2019 Sprung instant structures ltd.